Every hobby begins with a single step; start off on the right foot with a Kato "Starter Series" train set! Ideal for beginning modelers who already have a track setup or who are looking to purchase one of Kato's Master Series Track Sets. Every hobby begins with a single step; start off on the right foot with a Kato "Starter Series" train set! 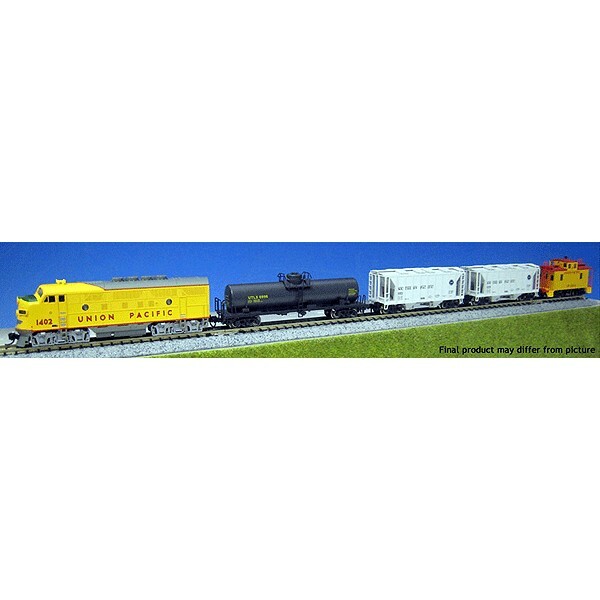 Ideal for beginning modelers who already have a track setup or who are looking to purchase one of Kato's Master Series Track Sets. Each set includes a Kato locomotive along with an assortment of appropriate rolling stock to create a great beginning train that is both enjoyable and versatile - just add track and power! Everything included meets the same high standards as Kato's individually packaged products, and are fully capable of being expanded or rolled into existing layouts. Each F7 Freight Train set includes one of Kato's EMD F7A locomotives, two ACF Covered Hoppers, a tank car, and an appropriately painted caboose. The F7A locomotive is DCC friendly and can be easily upgraded for Digital Command Control.